One woman rode outward across whole continents and forged personal connections in remote and forbidden countries. Her vulnerability and good humor were her strengths. Another rode inward through her own psyche to understand the allure of motorcycles and the people who ride them. Her fearless and honest introspection were her guides. Their spiritual ancestor rode onward to confront the institutionalized racism and sexism of Jim Crow America. Her powerful faith and personal toughness were her allies. Lois Pryce rode all the way down to the southern tip of South America, from Alaska to Tierra del Fuego, where you can smell Antarctica 620 miles away across the Drake Passage. She rode all the way from London to Cape Town, traversing the Sahara Desert, the jungled interior of sub-Saharan Africa, and the sun-blasted hills of South Africa. She rode across Turkey and crossed into Iran, a country that we in the US and the UK have been locked in a cold war with for 40 years. It was her most intimate trip, a journey around the country that brought her into close contact with dozens of ordinary Iranians who showered her with kindness. Pryce did what so many only dream of. 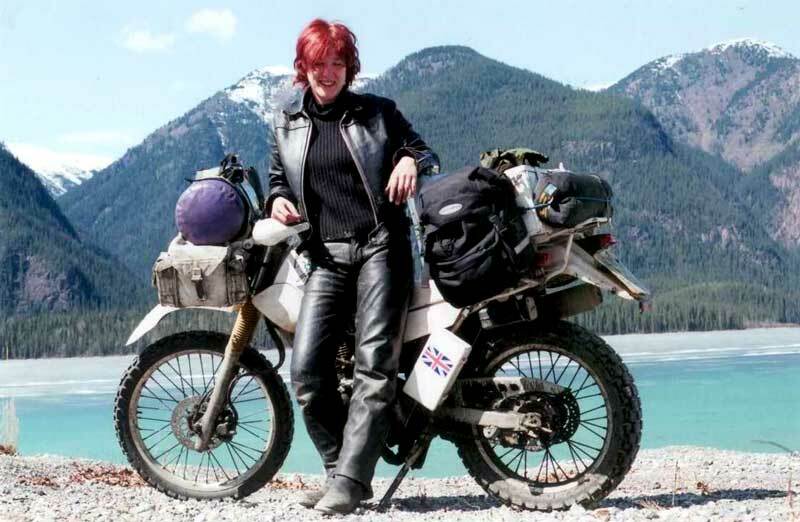 She left a desk job with the BBC and set out to explore the world by motorcycle. 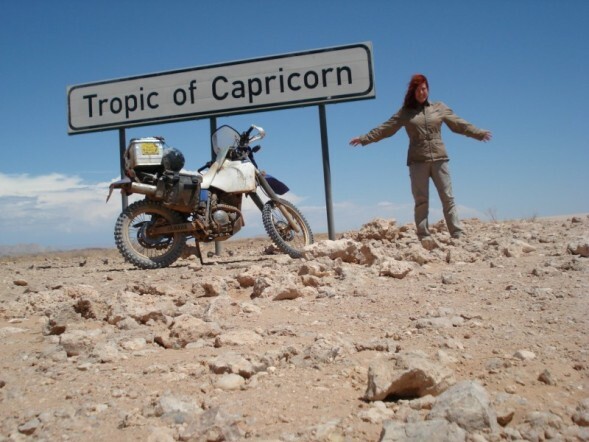 She’s taken three epic motorcycle trips: from Alaska to the southern tip of South America, from London to Cape Town, South Africa, and from Istanbul to Iran. Along the way, she witnessed the aftermath of a horrific motorcycle crash that left one of her riding buddies with a fractured skull and a mangled arm. She clashed with officious policemen and border control officers who seemed determined to thwart her desire to see what lay beyond the next hill. She endured the heat of the Sahara Desert and the bone-chilling cold of the Zagros Mountains in northwestern Iran. Never one to follow the motorcycling in-crowd, Pryce rides smaller bikes—225 and 250 cc Yamahas that are light, easy to work on, and far more in keeping with the motorcycles in the places she travels than big BMWs, Harleys, or Ducatis. Pryce also gained a unique perspective on the perception that motorcycles as dangerous machines. One of the scariest days of her life occurred in the Republic of Congo, when she was forced to take a train from Loutété to Brazzaville because the road was “too dangerous” to be traversed by a lone woman on a motorcycle. She was shut up in a boxcar with her motorcycle and a dozen intoxicated male Congolese soldiers. There was no escape. She spent a sleepless night sitting on the floor of the boxcar by her bike, fending off some soldiers who wanted to steal her supplies and other soldiers who made it clear they might want something more from her. Had she been out on the road, she could have escaped those dangers. Motorcycling is so much more experimental than driving. Riding allows you to experience life through your five senses instead of watching it through a windshield. Peter Ter Horst, Spokesman for The American Motorcycle Association & President of SymPoint Communications. 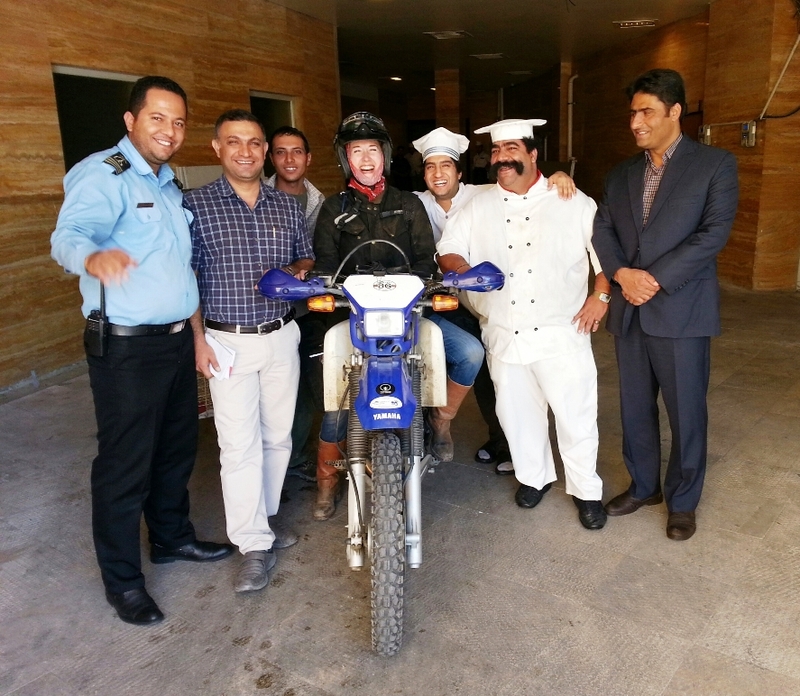 But despite that terrifying situation—and despite being assaulted by a meth-head gas station attendant in Iran, Pryce believes that being a woman on a motorcycle in a foreign land actually helps keep her safer than a man would be. I’ve known Lois since 2010 and consider her to be a remarkable world traveler and gifted writer. She’s one of the original group of motorcycle adventurers and also one of the first women riders to take on the world solo. Few authors in this genre can capture these life-changing experiences, inform us how things really are out there, and provide so many chuckles along the way. 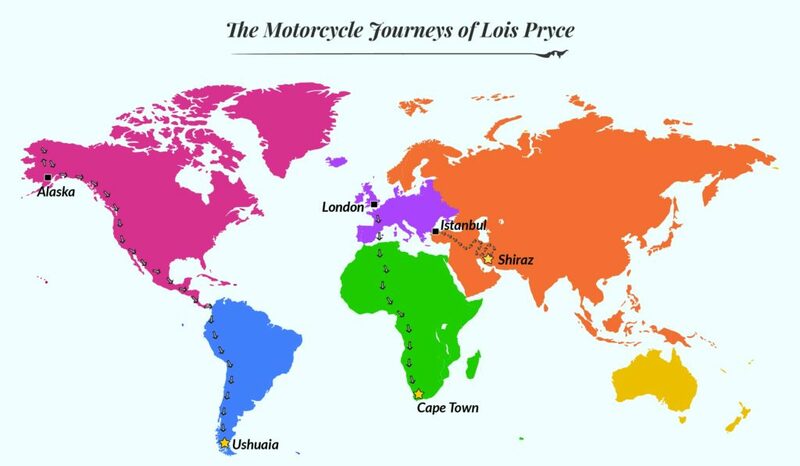 In between epic motorcycle journeys, Pryce wrote three books: Lois on the Loose, about her trip through North and South America, Red Tape and White Knuckles: One Woman’s Adventure Through Africa, and Revolutionary Ride: On the Road in Search of the Real Iran. With her husband, Austin Vince, she co-organizes the Adventure Travel Film Festival, an event dedicated to showing 100 years of adventure travel films, listening to good music, and hearing talks from trekkers, bicyclists, overlanders, sailors—and, of course, motorcyclists. By writing The Perfect Vehicle, Pierson had hoped to communicate the essence of motorcycling to a general audience. But that’s not the way it worked out. The book was popular among motorcyclists, but non-riders took little note of it. 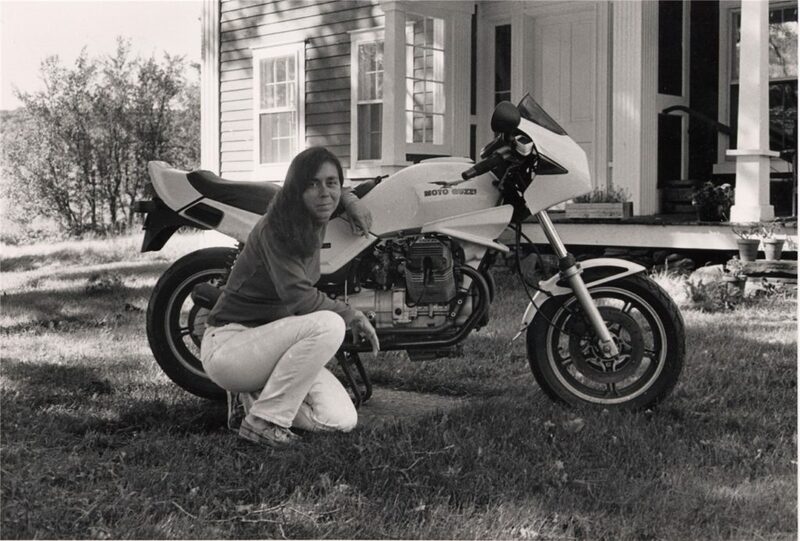 Pierson came to motorcycling in her mid-twenties, after getting her bachelor’s from Vassar and her master’s from Columbia. 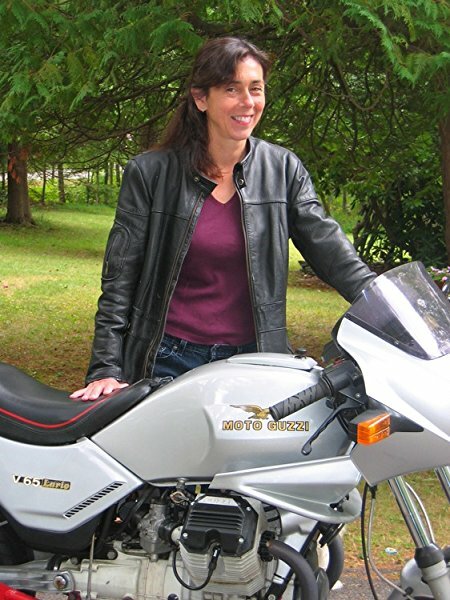 Once she discovered motorcycles, a different kind of learning took hold of her. She discovered the joy, power, peace, fear, vulnerability, and happiness that can visit a rider in just ten miles. She rode around New York City and its near environs. She rode America through and through. She rode in Europe. But the real travel is through the landscape of the psyche. The Perfect Vehicle is as much of a travelogue as Zen and the Art of Motorcycle Maintenance is about the highways of the northwest. Which is to say that it isn’t really about those roadways at all. Melissa writes so that you are on that bike, the wind rushing by, and feeling every bump and bend in the road. Beyond summoning the exquisite sense of riding a motorcycle, she summons the bike’s physicality in its lines and weight, but especially in its sound. More recently, Pierson took a trip through India, another one of those journeys that broadens the mind, the soul, and the horizon. And she’s still discovering what it is about motorcycles. Nevertheless, on her sixteenth birthday, Stringfield’s adoptive mother gifted her with what she really wanted: a ride of her own. It was a 1928 Indian Scout, an American contraption that looked like a bicycle on steroids with a 603 cc V-twin engine nestled between the wheels. It was heavy and loud and belched exhaust, but it must have seemed like freedom. It was her first and last Indian. Thereafter, Stringfield discovered Harley-Davidsons and immediately developed the kind of brand loyalty that marque inspires. She owned 27 different Harleys in her lifetime. By the time she was 19, Stringfield was riding all over the country. Some say she would choose her destinations by tossing a penny onto a map. It’s hard for those of us who were raised alongside the Interstate Highway System to imagine how difficult motorcycle travel was in 1930. Roads in the United States at that time were topped with graded earth, sand, clay, or gravel—surfaces not especially hospitable to motorcycle traffic. Even the basics of navigating from town to town were difficult in an era where interstate roadmaps were still in their infancy. The risks of motorcycling and the sheer difficulty of long-distance travel in that era would daunt all but the hardiest souls. Stringfield, however, encountered additional obstacles: her black skin and her woman’s body. It was perfectly legal in the 1930s for hotels, restaurants, and inns to refuse to serve African Americans and unaccompanied women. Stringfield spent many nights staying with black families she met on her travels. Other evenings were passed parked at a filling station and sleeping atop her bike. These aspects of Jim Crow America were almost benign compared to the more serious dangers of being black and far from home in a white world. In the 1930s, 119 African Americans were lynched. Hundreds of others were beaten, tortured, raped, and humiliated. The protection of the law was uncertain and inconstant, to say the least. Bessie Stringfield was a black woman in a white man’s world and a woman in a male-dominated culture. She helped pave the way for the civil rights era. She’s definitely a hero! But Stringfield was undeterred. 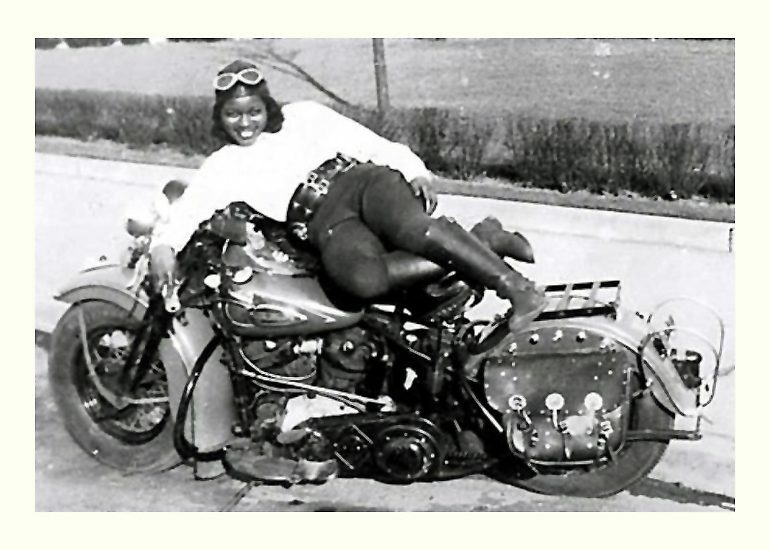 She became the first African American woman to ride a motorcycle in every one of the contiguous 48 states. She rode in Brazil, Haiti, and Europe. She raced in flat track competitions and performed motorcycle stunts at carnivals and fairs. During World War II, she served as a civilian motorcycle courier for the US Army in the pre-fax, pre-internet era, carrying important military documents from base to base. When pressed by reporters and biographers, she would relate an incident where a white man in a pickup truck deliberately ran her off the road and knocked her off her bike. She told other stories about being followed down a dirt road by an angry white mob only to outrun them and fill her tank at a gas station owned by a kindly white man who let her fill up for free. But even those tellings are devoid of anger or bitterness. Perhaps she guarded her carefully-wrought image as a positive, can-do spirit. Perhaps her powerful Catholic faith impelled her to turn the other cheek. She frequently said that “the man upstairs” was looking out for her. Or maybe she was actually lucky and plucky enough to have avoided the worst of Jim Crow violence and hatred. But one oft-told anecdote hints at the quiet pride she took in her skill and determination. 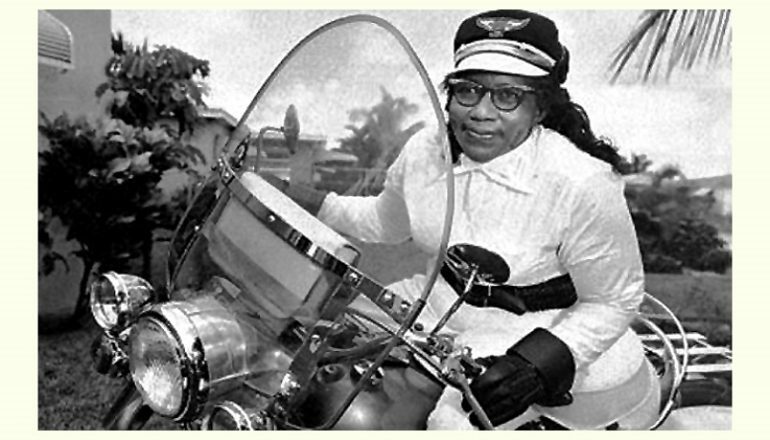 When she moved to Florida in the 1950s, she found herself repeatedly pulled over by the police for “riding while black.” As Stringfield tells the story, the Miami police told here that black women were not allowed to ride motorcycles in Miami. Stringfield died in 1992 at the age of 82. She rode her Harley to church every Sunday until shortly before her death. Recognizing that it had neglected to write about her death when it occurred, The New York Times belatedly published an obituary in 2018. In 2000, the American Motorcyclist Association Hall of Fame created the Bessie Stringfield Award to honor “an individual who has been instrumental in bringing emerging markets into the world of motorcycling.” Two years later, the AMA inducted her into its Hall of Fame. And today, there are legions of women who ride in her honor. Most of us who ride will never even attempt the outrageous distances that Lois Pryce covered. 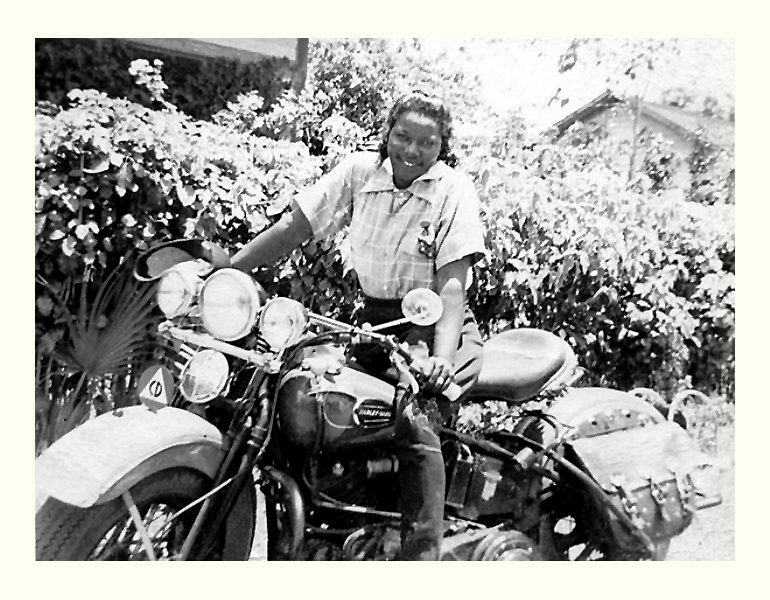 We’ll never have the insight to report on the combination of insecurities, contradictions, and fearless self-analysis that allowed Melissa Holbrook Pierson to dive deep into “what it is about motorcycles.” And we’ll never (we hope) have to transcend the racism and sexism of the day and smash through the cultural stereotypes that Bessie Stringfield had to contend with for much of her riding life. Riding outward, inward, and onward, these three women have mapped out trails for the rest of us. Now it’s up to us to act on their inspiration. This article was first published on www.ConsumersAdvocate.org, after request we reposted the article here. Thank you for these inspiring stories!